A total of 210 PKK terrorists, including so-called senior operatives targeting civilians, in their bid to disrupt peace in Turkey have been "neutralized" as part of anti-terror operations across the country and abroad in October. Turkish authorities often use the word "neutralized" in statements to imply the terrorists in question either surrendered, were killed or captured. 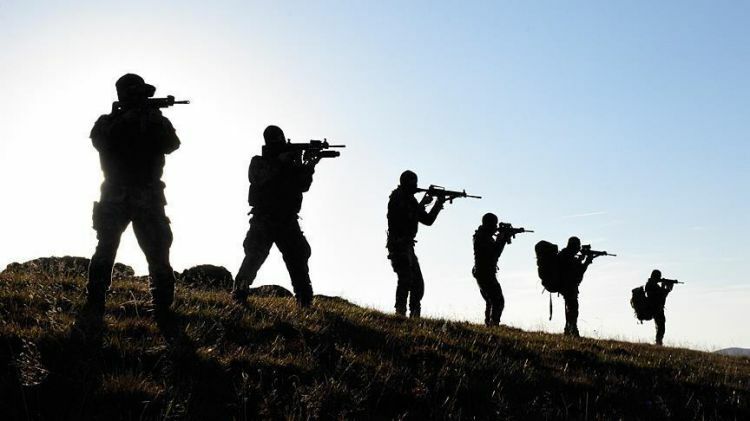 Turkish Armed Forces, Security General Directorate, General Command of Gendarmerie and National Intelligence Service resolutely continue to chase terrorist organizations that try to disturb the peace and brotherhood in the country. According to information compiled by Anadolu Agency, 10 security officers were martyred and one civilian was killed during the attacks by YPG/PKK between Oct. 1 and Oct. 31. During the attacks, one civilian was killed, while five security officers and three civilians were injured. Security forces destroyed shelters and depots of terrorists, mainly in Turkey's eastern and southeastern provinces. A total of 687 suspects were arrested and 125 of them remanded in custody in October. Serbest Paksoy, codenamed "Rezan", and Selcuk Kose, codenamed "Mahir Botan", were neutralized on Oct. 11 at Mt. Gabar of the southeastern Sirnak province. Yusuf Tunc, who was in the grey category of the interior ministry's wanted list, was killed on Oct. 17 in an operation carried out by security forces in southeastern Adiyaman province. Known by the initials K.B., a PKK terrorist who killed security guard Mehmet Paksoy in 2017, was captured during an operation in the Uludere district of Sirnak on Oct. 24. Turkish security forces captured Emrah Nayci, the terror group's so-called senior representative of Gabar, in an operation in the rural areas of Sirnak on Oct. 31. The police in cooperation with the Turkish intelligence also arrested a senior member of the PKK/KCK, identified as Devlet Aslan, in the southeastern province of Batman. Aslan is reportedly one of the heads of the terrorist group’s so-called Belgium branch. One of the alleged regional leaders of terrorist group PKK/KCK in Sweden, identified by the initials of H.B., was nabbed in a counter-terrorism operation in southeastern Diyarbakir province on Oct. 23. A total of eight Turkish soldiers were martyred and one other was injured during a PKK terrorist attack in the Gercus district of southeastern Batman province on Oct. 4. A Turkish soldier and a civilian were martyred and three others injured in an attack by PKK terrorists in southeastern Hakkari province on Oct. 9. A Turkish soldier was injured after a hand-made explosive detonated in the Dogubeyazit district in eastern Agri province on Oct. 11. A police officer was injured during a PKK attack in the Pervari district of southeastern Siirt province on Oct. 20. A Turkish soldier was martyred and another heavily injured in a PKK terror attack in the Dargecit district in southeastern Mardin province on Oct. 23.